One of the things I like least about this time of year is the pests. I'm talking about the insects and critters that wreak havoc with my home and garden. The pest of the month is the carpenter bee. Last month the battle was with ants and in April, we were fighting the annual infestation of winter moth caterpillars that are trying to kill my beautiful weeping cherry tree. Those battles seem to be behind me and for now, the focus is on the pesky carpenter bees. 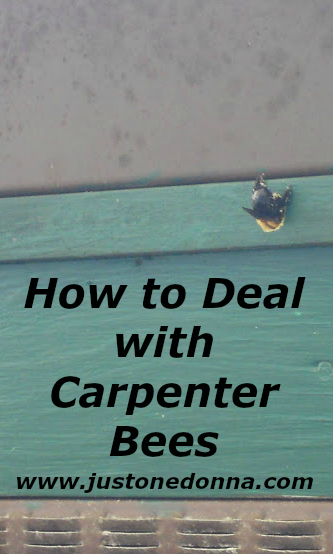 You might be wondering what the heck a carpenter bee is. I never even knew they existed until a couple of years ago. You can see the backside of one in the picture below. They might be mistaken for a big bumblebee, but their abdomen is shiny black in comparison to the fuzzy abdomen of the bumblebee. You'll often see them hovering in the air around the roofline of your home. If you see them, you'll want to pay attention. They may take up residence in your home. Carpenter bees may resemble bumblebees but nest in wood rather than in the ground like bumble bees. Carpenter bees prefer bare, unpainted wood (my house is painted and that doesn't stop them). After mating, the females excavate tunnels in which they will lay their eggs. Balls of pollen are provided to feed the larvae. The extent of damage created by the tunnels may be extensive. When carpenter bees first came to my attention, it wasn't the hovering around my roofline that I noticed. 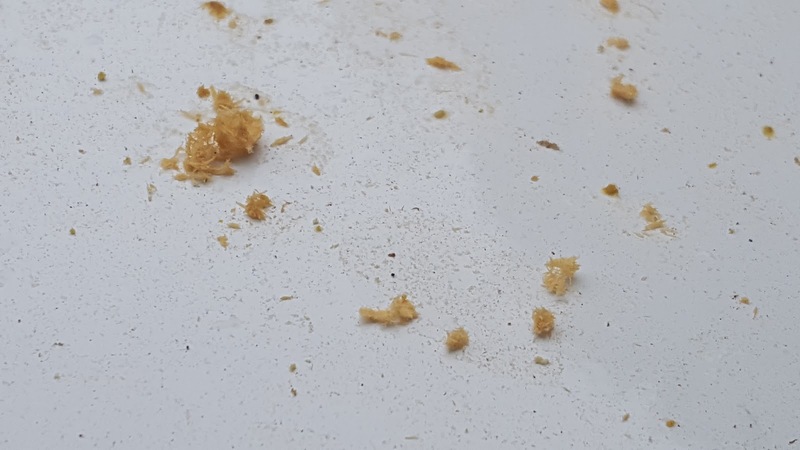 While watering a squash plant that was in a pot on my deck I saw what looked like sawdust all over the plant. Isn't that the loveliest, round, perfectly drilled hole you have ever seen? One might think that Hubby was out very early in the morning drilling holes in the fascia boards of our house for some unknown reason. While I was standing there looking at the hole, along came the carpenter bee you saw pictured above. Yes, the tail end of that insect sticking out of the hole belongs to an annoying carpenter bee. Well, the carpenter bees are back again. This week I was alerted by chance when I looked out my window and saw signs of sawdust on top of our air conditioner. 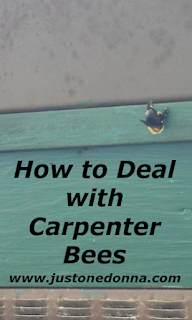 What Can You Do about Carpenter Bees? Liquid sprays of carbaryl (Sevin), chlorpyrifos (Dursban), or a synthetic pyrethroid (e.g., permethrin or cyfluthrin) can be applied as a preventive to wood surfaces that are attracting the bees. Residual effectiveness of these insecticides is often only 1-2 weeks, however, and the treatment may need to be repeated. We choose to treat the area with pesticides. You'll want to leave the treated hole open for two or three days to allow the insecticide to work and then fill the hole with a 3/8"dowel and repaint. Yes, a 3/8" dowel will fit exactly. Go figure! One of the things I do not miss about living in the log house is carpenter bees! I always thought of my log house as a cupcake those bees would feast on, and I hated them. Thanks for writing about this. Hah, a cupcake for the bees! You made me laugh, Lydia. I just wish they'd leave my house alone! I live in FL and belong to the Bug A Month Club. We go from one bug to another. The ones that look like big wasp that make holes in the ground were a challenge. Finally, I put white lithium grease on the hole and success.